Welcome to the warm heart of Africa! Welcome to Lilongwe Airport, you transfer to Nchalo Airstrip for a 45-minute flight to Mkulumadzi Lodge in the Majete Wildlife Reserve. The lodge is set beneath giant leadwood and mango trees across a picturesque footbridge suspended over the Mkulumadzi River. 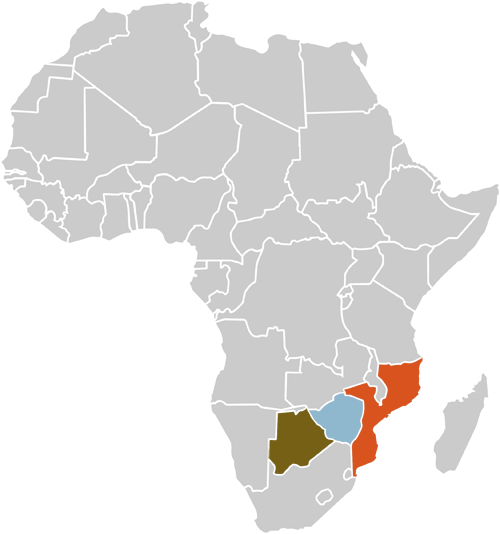 Majete is one of Malawi’s few reserves where the Big 5 can be seen. In addition to elephant, black rhino, leopard, buffalo and lion, the reserve is home to sable antelope, zebra, Lichtenstein’s hartebeest and eland. Take in this game-rich wilderness on drives, nature walks and boat safaris. For wildlife enthusiasts and keen photographers the lodge has a hide at the waterhole, providing impressively up-close game viewing. You can even enjoy an authentic cultural encounter at the local village. If you simply want to rest and recharge, there are plenty of lounging spots to choose from – favourite retreats are beside the sparkling pool or on the timber viewing deck. After breakfast you travel to Lake Malawi, one of Africa’s Great Lakes and home to more species of fish than any other body of fresh water. The underwater attractions are comparable to a tropical island surrounded by coral reefs – there are a whopping 1,000 species of ciclid in these waters. The heavenly beauty of the water sparkling beneath the night sky gave rise to the nickname Lake of Stars. Your home for the next four nights is Pumulani Lake Lodge. Only 10 luxury villas are set in the forested hillside above the shore offering spectacular views over the lake. Pack your days with action – cruising on a traditional dhow, birding, guided nature walks, lakeside picnics and plenty of non-motorised water sports. Snorkelling, kayaking, water skiing and scuba diving are key attractions. The infinity pool with its views and private beach on the shore below invite you to simply laze in the sunshine within easy reach of the lodge’s friendly service. The food here is nothing short of superb. Malawi is rightly called the warm heart of Africa, stealing a little of your own heart after a week of fresh air, sunny days and friendly service. The uncrowded wilderness of Majete has brought you close to the stars of the Big 5; you snorkelled in the lake’s underwater paradise and toasted the setting sun from the deck of a traditional dhow – all these memories you carry home with you.